As mother of three amazing kids parents, I work hard to protect them, I am sure you do as well. Even before they cross their first street, we start teaching them how to assess and address the risks that come with daily living. When it comes to money, this can be a bigger challenge. It takes patience, discipline and repetition to become financially savvy. But, the earlier you start teaching them, the more likely it is they’ll be ready to make money-smart decisions by the time they receive their first paycheck. 1. Lead by example. Even as they are seated in the cart at the grocery store, let them see you take your time to comparison shop and check for coupons before you choose a product. Help them understand that it isn’t as much about the amount of money you spend—even if you can afford it—as it is the value you receive for what you get. 2. 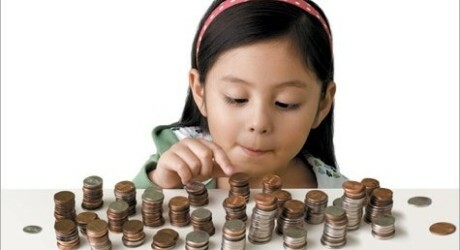 Encourage them to start saving when they’re young. By kindergarten, kids are able to understand that it takes time to get what you want. Piggybanks are good learning tools for reinforcing this. 3. Stress the difference between wants and needs. Both understanding the difference and training yourself to only buy what you can afford once a “need” is established are keys to leading a prosperous life. 4. Let them see how saving works. The jar concept helps make the difference between short-term savings and long-term savings concrete and visible. Kids can see where their money goes and watch it accumulate. They may use one jar to save for a specific goal, like a video game that will be coming out in a few months. Then, they may have a jar for long-term savings, like the car they said they want to be able to buy when they turn 16 or their college education, a goal you want them to aspire to. At my household we have a jar for giving to reinforce our family’s tithing to our Church, it is very important to think of and share with others. 5. Insist they pay themselves first. As children start to receive allowances and learn that doing extra chores—at home and for neighbors—can lead to extra cash, teach them the concept of paying themselves first. In my house they must set aside the Tithe money. Encourage them to add some portion of their earnings to savings before spending the rest. 6. Bring them to the bank. Today, most adults rely on electronic banking and ATMs to handle their personal finances. However, it can help children understand where the money goes when it gets deposited and to see how it is withdrawn by literally taking them to the bank. Once they get the mechanics of how money flows into and out of their accounts, making the switch to electronic transfers and the use of debit cards can be much easier and less likely to result in overdraft charges or unnecessary fees. 7. Exercise care when using credit cards around children. To a child, paying with a credit card resembles waving a magic wand to get whatever you want, when you want it. If you aren’t using cash in their presence, try to let your children catch you doing your monthly bills to help them understand that the money to pay for those charged purchases is quite real and comes out of your account.